US 399 was a rather short highway that went from Ventura to Pumpkin Center, just south of Bakersfield. 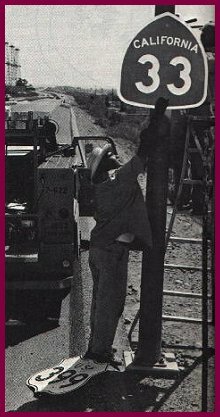 It was and still is (as SR-33) the main road connecting Ventura and Santa Barbara to the San Joaquin Valley. The nearest roads to the San Joaquin Valley are I-5 (US 99), over 40 miles to the east and SR-166 which is 106 miles to the north via US 101. It also provides access to the Los Padres National Forest, the former home of the endangered California Condor. US 399 started at US 101 in Ventura where SR-33 is now. It then followed SR-33 north to the intersection with SR-166 where it was co-signed with SR-166 as SR-33 is today. It continued north from SR-166 to SR-119. It then followed SR-119 to its end at SR-99 (US 99). 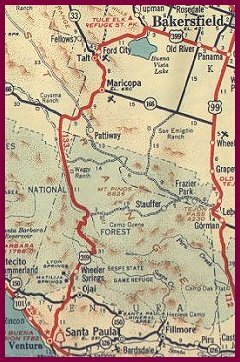 Map at right is from 1939 and shows the complete route of US 399. US 399 was completely decommissioned on July 1, 1964. The original routing still exists as SR-33 and SR-119.